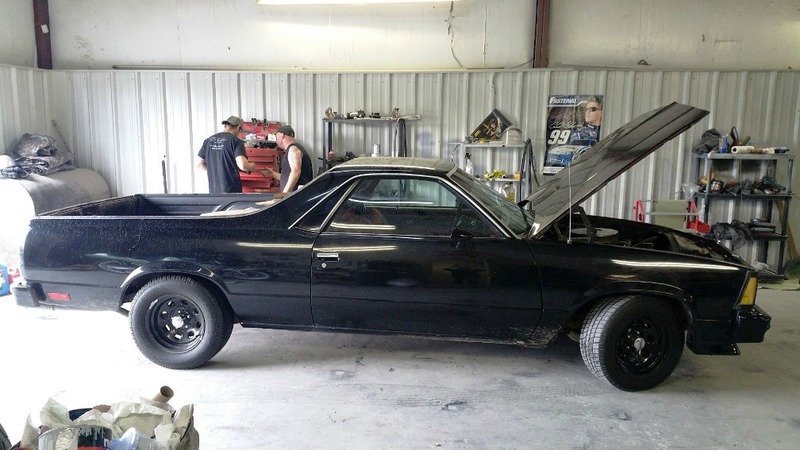 There are big changes happening to the El Camino. 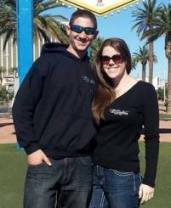 We are talking complete restoration, from the motor to the body and paint. And let me tell you, both the motor and the finished paint work are going to blow your mind. 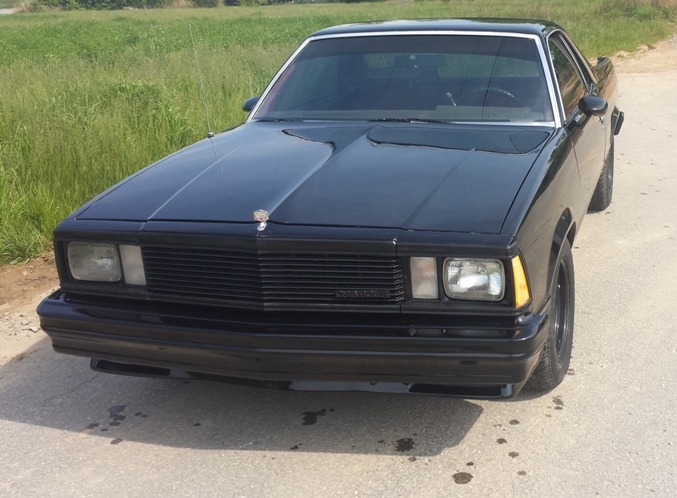 The current (soon to be ‘old’) paint job is jet black with red ghost flames on the hood. 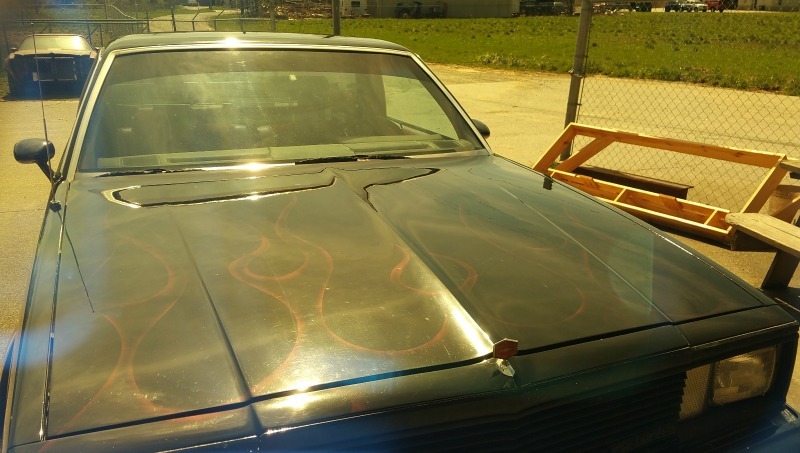 The flames are ghosted in so well that you only see them when you get right up on the car. Otherwise, the entire car looks black. It’s been fun to see people walk by admiring the car, and then realize that it gets even better with the custom flames hidden in there. 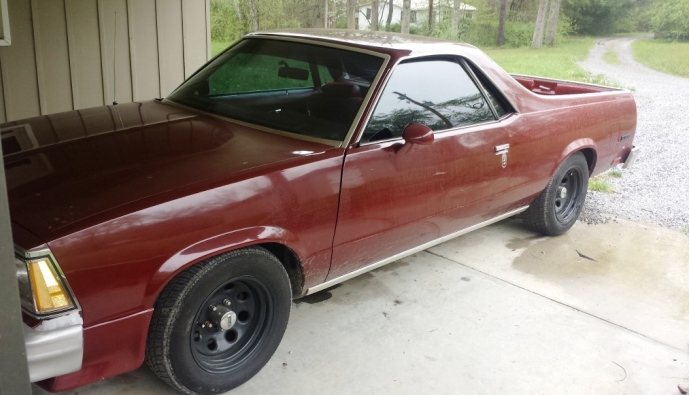 Tim believes that people either love El Caminos or they hate them. He loves them. He had one when he was younger that he was going to fix up, but moved to NC before he was able to finish it. 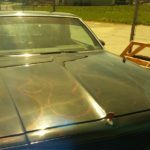 When an El Camino came up on craigslist at the right time, he decided to get one that he could eventually restore and paint how he wanted. 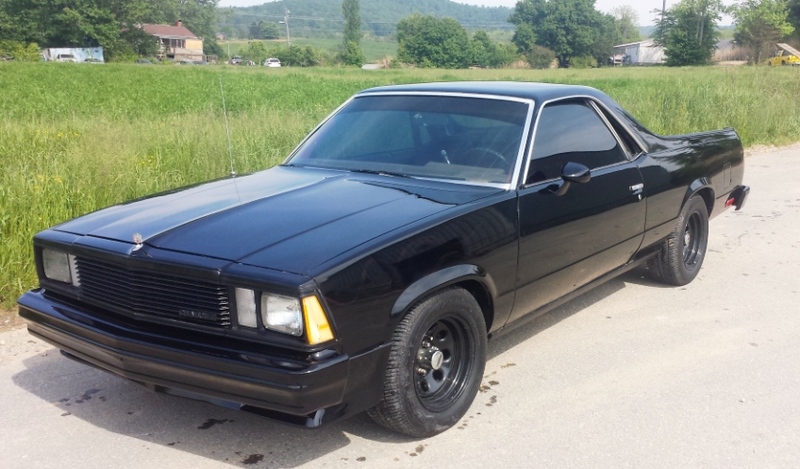 The picture to the right is the ’81 El Camino when we first bought it. A dark red that would of course be getting a new paint job. 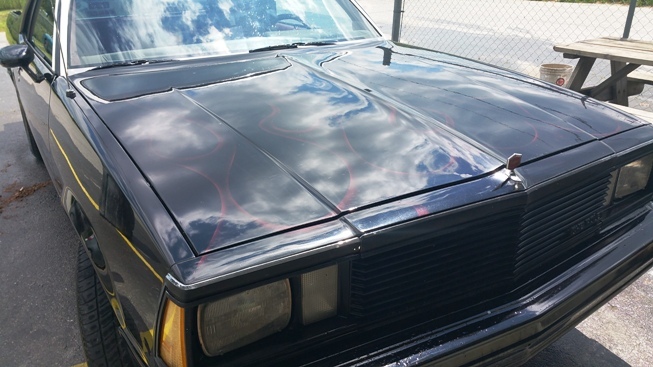 In keeping with the red accents that were already in the interior, Tim painted it black with red ghost flames on the hood. Being a painter means always thinking up new paint schemes and wanting to drive something completely custom. The new paint job is going to have several different elements that will make it a truly killer paint job. 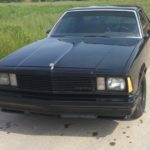 The original 350 motor that was in the El Camino began to knock and have issues. We realized it needed a whole mess of stuff, and that it’d be better to rebuild it than continue fixing it little by little. 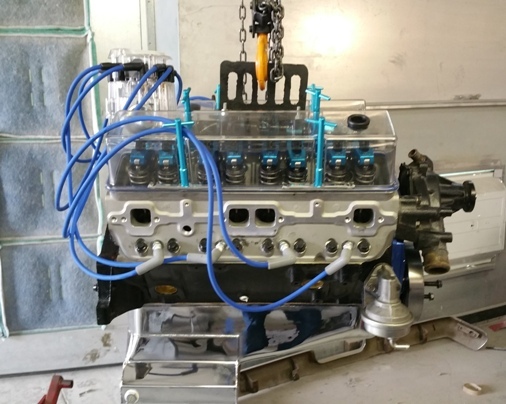 Tim decided to have our friends at Dean Motorsports in Mills River rebuild the 350 into an awesome performance motor. We went with a 383 stroker kit but had the cylinders bored to 60 over, making it a 388. Tim did lots of research and picked every part on this motor. 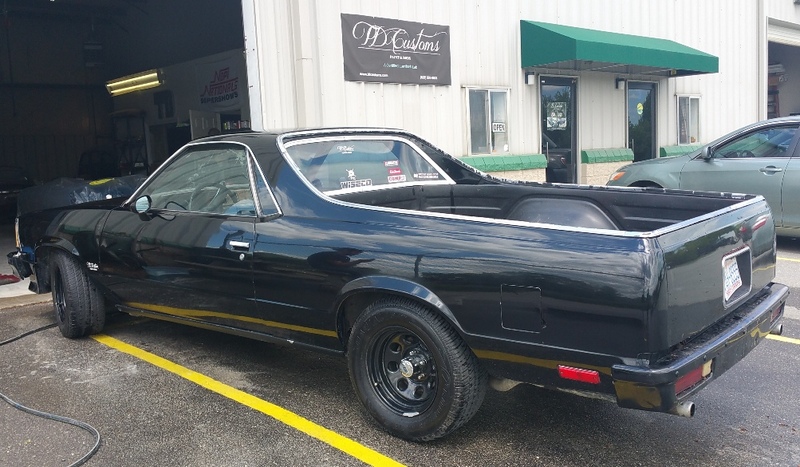 The blue parts here will compliment the El Camino’s paint job perfectly. And it goes without saying it’ll be fast and loud and all that good stuff. ‘Til now he’s been enjoying the ‘El Slowmino’ as he likes to call it, but it’ll soon be anything but that. 388 stroker: Isn’t it pretty! 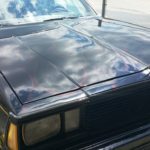 The El Camino is getting a brand new paint job. As a custom paint shop, that is a given. The ELCO will be going from black with red accents to a blue color with different accents, including electroluminescent paint. Tim worked on the body work the last time he painted the car, so it’s in good shape. A few chips and scratches have developed since then, so he’ll have to touch those up and make sure the body lines are completely straight. It’s hard to describe the new paint scheme. You know it won’t be your average paint job. It’s going to be a rare blue color (that Tim will likely design himself) with various effects and design details throughout. It’ll have some Lumilor on it. We don’t want to give away all the juicy details just yet, but it’s going to be awesome. 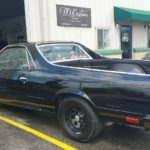 Follow us on Facebook to keep up with the very latest news and shop updates for the El Camino and lots of other good stuff. You are going to want to see the finished product of this one! Now it’s time to pull it in and get started! 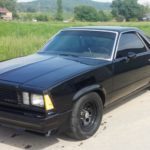 The TD Customs ELCO: Before – Time to get started! No Replies to "Saying goodbye to the El Camino as we know it"